Communication is a critical part of life. Language is a part of communicating. When the person with whom one is trying to communicate does not share the same language base, the results can be quite interesting…or embarrassing. 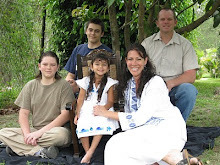 When Ed and I moved to Honduras, Central America is 2001 with our two young sons, none of us spoke any Spanish, which was a problem because Spanish is the language the people of Honduras speak. We quickly set about trying to learn a grammatical base of the language and train our tongues to adapt to the local accent. So, we were thrust into interactions and service without any Spanish skills. Yes, it was stressful, yes it was frustrating, but it also makes for some good embarrassing stories. For instance, we met two cement block workers who were very friendly. Both of the men came to work near our home each morning. One morning Ed and I went over to say hello, actually “hola”, and to show them our desire to connect with them by our presence. After about 30 seconds I had expended all the Spanish I knew and was going to leave. But, then I recalled the lesson from the previous day about the titles of family members. So, with a huge smile on my face I tried to ask them, “So, how are your wives doing today?”. The look on their faces told me that I had not gotten some part of that sentence correct. There was a flash of anger, then embarrassment, then humor as they studied my expression. I stood there, heat rising in my face and neck, when I suddenly realized I had asked them how their husbands were doing. They laughed it off in the end, but I was totally humiliated. Oops. 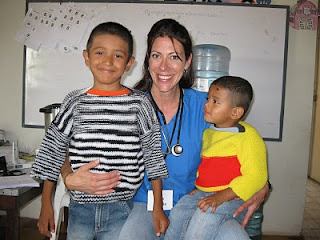 Then there was the time I was serving on a medical brigade in an extremely rural area near the town of Botijas. The day began well and I felt like I was really connecting and understanding the spoken language as well as the nuances of the body language. A certain young woman came and sat in front of me. I took her vitals, did an initial physical exam, all the while asking her different questions about her ailments. At one point she showed me some bruised on her leg and told me she was suffering from domestic violence. (Okay, at least that is what I thought she said.) Not wanting to miss the spiritual and emotional ramifications of her needs, I signaled for a Honduran pastor to come over and I privately explained the situation to him. He proceeded to gently speak with the woman, trying to win her trust. After about 10 minutes, the woman became indignant and loudly demanded of me, “Just what do you think I told you?”. I took her arm and quietly explained that the Pastor could be trusted to discuss her domestic violence problem. She wrinkled her bronze forehead and looked at me like I was crazy. She then went on to tell me she never said any such thing. She insisted I treat her body aches and let her be on her way. When she said the Spanish words again, I knew why I had misunderstood. The words violencia and dolencia sound a lot alike when they proceed from a mouth with no teeth and rural accent. Big Oops. Ordering coffee in a common enough task, unless you ask for “coffee topped with snot” instead of “coffee topped with mocha chocolate”, the subtle difference between the Spanish words moco and mocha. Let’s just say that about 6 other customers had a great laugh at my expense. Oops again. As I began making physical plans for this first-ever medical and dental outreach for Foundation Casa de Luz, I spoke with several doctors and nurses to ask their opinion on how many patients for which we should plan to provide care and medicines. The number generally came in around 75 to 100 patients. So, I began to budget and purchase medicines and medical supplies for around 100 people. Several of YOU sent funds to specifically be used to purchase these supplies. THANK YOU!! It is exciting to share that out of 17 volunteers and medical professionals, 14 were Hondurans who spent the day serving their own people! The 3 North Americans were a huge blessing, but all 3 of us agreed it was fantastic to watch the Honduran people be enabled and equipped to do the work of the ministry on their own! Extraordinary! 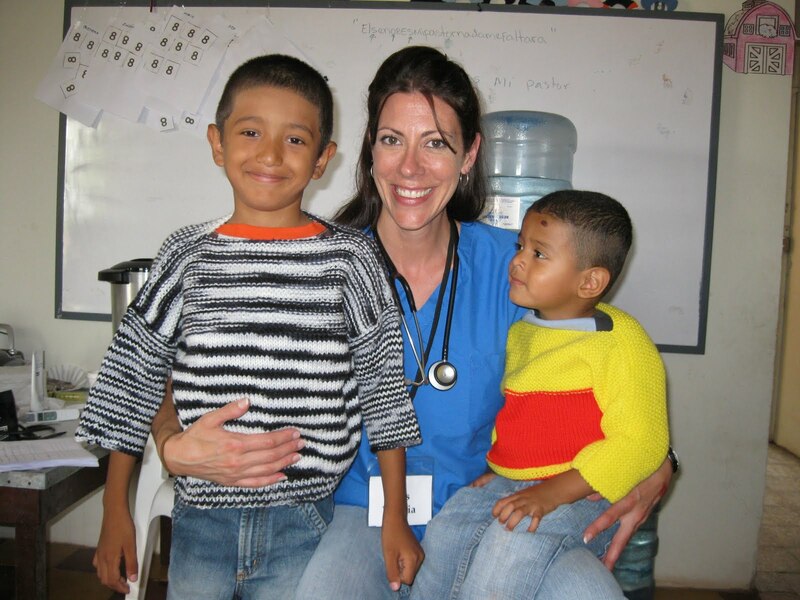 The 3 medical doctors and 2 dentists we hired were all Hondurans. One Honduran woman cooked lunch, another helped dispense medications along with our North American nurse, 3 Honduran men shared the Gospel with the patients, others carried chairs, swept the floor, washed blood from medical instruments, or simply helped hold squirming babies so their moms could receive medical care. From the time we opened the doors to our child care facility to allow patients to begin receiving care, the stream of children and adults never once ceased until we closed the doors at 5pm! The human chain of those waiting for care snaked all around our property and into the mud-covered street. We were blessed that God granted us a cloudy day with no intense sun scorching down, and no soaking rains to bother the patients. We also had electricity ALL the time we were serving the sick! (That, in and of itself, is a rarity lately!) As the line of patients continued to grow, I began to become concerned about running short of medicines or supplies, since I had only planned for around 100 people maximum. We prayed for God to meet the need and, interestingly, just like the widow's oil in 1Kings 17:14, our supplies were more than sufficient for each patient, and we even brought home a small box of left-overs to use in the future! Glory to God! At one point the press of the crowd, the cries of sick infants, the pain etched on some of the faces, and the strenuous effort of trying to maintain order in the middle of the frenzy of activity was almost more than I could bear up under, and I felt a desire to just close my eyes and wish it all away. I am glad that at our weakest moments God is most glorified! Instead of wishing it away, I sensed God nudge me to keep pressing into Him and keep praying for strength and inner calm even in the midst of chaotic surroundings. (Maybe no one else can understand what I am saying and maybe I am the only one who likes to try to think she has some sort of control over her surroundings and doesn't like her life too "messy", if so, then just ignore what I am rambling about...but if you, too, struggle with being at peace in the middle of crisis, maybe this is a helpful reminder.) The more I kept my focus on Christ, the more I could sense His presence and guidance and peace over my own heart. Where the "rubber meets the road" for me spiritually, is when I take head knowledge and move it to heart practice, "do the walk" not just the talk; put the Word into practice. As I stilled my heart and mind in God's presence, His peace and joy flowed out of me and I was able to continue smiling, sharing, touching, hugging, taking blood pressures and temperatures, and leading our team without a melt down. Not one thing changed in my environment. The babies kept right on crying, the line of patients kept pressing in, the muggy air go muggier, the mess got messier...but Christ was present in it all. He lent His strength and peace, in contrast to the weakness and strife I felt initially. Instead of me trying to grip tight to control, I let go and Christ did it all! He is excellently equipped for every need, if I will only allow Him access to meet my need and cooperate with Him! Praise God, His mercy is plentiful and He never tires of extending patience to me! God is so good. Yesterday, as a result of one medical and dental outreach, 169 ailing bodies received physical mending, many broken hearts received spiritual healing, and one weak and needy missionary received a fresh reminder of the power of God's peace for every circumstance in life...even, or especially, when we are supposed to be the ones in the lead! Thank the Lord that in His Kingdom leaders don't have to be perfect, we just need to stay connected to The King! I urge you to stay connected...it makes all the difference between victory or defeat! Have you discovered that many people do not think much at all about eternity? People think a great deal about what car to drive, what meal to order, what kind of sporting event to watch on television, but they think very little about how much eternity matters. We are Ed, Valerie, Wes, AJ, and Cheynece Schubert, your missionaries to Honduras, Central America. We have been serving on the field in Honduras for nearly nine years, ministering to children and adults who need to know that “eternity matters”. “Because Eternity Matters” is our family motto. We use this powerful phrase to sign all our letters, e-mails, and cards. It has become a phrase by which people have come to recognize our family. It is a personal reminder to us of the reason we left our family dairy farm in northern Illinois to transplant our family to a country which is very different from the United States. Focusing on eternity provides a strong motivation when our ministry becomes very difficult or even frightening, such as during the civil unrest this last year in Honduras. Keeping our eyes on things of eternity is the way we can maintain a solid base for all that we do on the mission field. Everything to which we set our hands and minds has to point others to the truth of an eternity in Jesus Christ. The country of Honduras is about the size of the state of Ohio, is largely Catholic in religious practice, is a major exporter of bananas, and has the second highest per-capita murder rate in the western hemisphere. 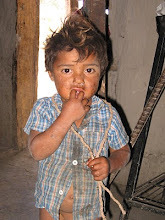 Approximately 80% of the population lives in abject poverty. UNICEF statistics estimate 150,000 children are without homes, and 99 out of every 1,000 children will not live to see their sixth birthday. Honduras is a land of strange and mysterious opposites. The people are warm and relational, yet at the same time violence and deceit run rampant from the lowliest shack to the highest echelon of the politically elite. There is great ugliness in encountering hunger, homelessness, and abandoned children, while at the same time we are surrounded by a natural beauty in the form of the rugged mountains and sandy beaches. There is a dark spirit of hopelessness and fear which paralyzes this nation, fed by a legalistic religious system which stresses rituals in place of true freedom in a relationship with Jesus. Religious images are everywhere, but virtually nowhere is Christ truly honored. 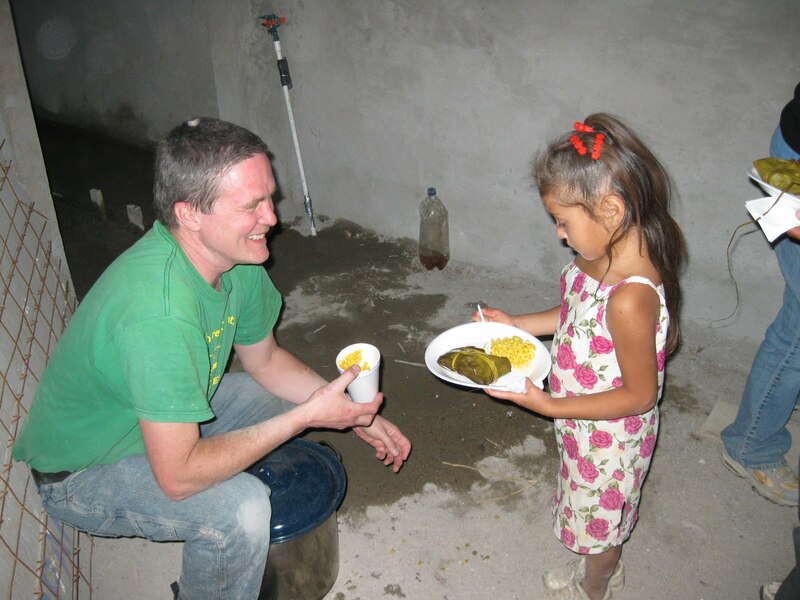 The majority of our mission service focuses on the very poor and often forgotten ones. Our inner-city child care center, Casa de Luz (House of Light), serves children from 1 to 7 years of age. We currently have 16 children who receive daily care. These are at-risk children, living below the poverty level. We provide 2 meals, 2 snacks, a bath, medical and dental care, and a safe and fun environment in which to grow and learn. With the eternities of these little ones firmly in our minds, we make Christ our foundation to all we do through the center. Some of the children have no running water or electricity in their own homes, so the daily baths at our child care center are their only opportunities to get clean. We currently rent a building to operate Casa de Luz center and are only able to provide for a maximum of 15-20 children. However, we have purchased a piece of land in the capital and are in the middle of a very large building project with plans to care for 75 children in our new facility. This building project will be our main focus for 2010-2011. Please pray for God’s blessing on this construction project. 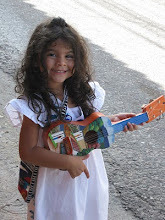 As an extension of our work with Casa de Luz, we have begun a program for 40 children in the town of Zambrano. The Zambrano campus is a Saturday program which provides Bible lessons, snack time, fun activities, arts, and English lessons in a two-hour program for children ages 4 to 8 years. The forty children in this program come from very needy families also. These children are largely neglected, filthy dirty from playing with garbage from dumps and sewers, and have virtually no basic manners. Most have heard of a “god” who demands rituals, but not many have heard of a Jesus who loves them enough to die for them to give them an eternal hope. Please pray for us to have great wisdom and gentleness with these precious ones. We also serve through a project called “Love Without Boundaries”. This project was founded by a Honduran couple with the purpose of providing Biblical discipleship and safe activities for children and teens. Over time, it has grown to also include ministries for adults. In this project, Valerie works with women, and their children, through Adult Bible Studies, a Baking Ministry, and English classes. Ed serves through construction projects such as carpentry and cement work, creating the physical ability for these community projects to take place. No act of service is outside the scope of remembering that eternity has significance. God uses all gifts, not just ones like preaching or teaching. In God’s economy, no gift offered to Him in humility is wasted. With an eternal perspective, pounding a nail becomes just as “holy and sacred” as a whispered prayer. Nine months ago Ed began to assist with a project which focuses on pastoral training for Honduran men. Ed has been working alongside another missionary constructing the very first building for this new endeavor. The work is very physical and tough. With no electricity, everything has to be done by hand. No big power tools for this job! Ed has helped design the ministry building and has poured a lot of sweat (literally) into the project. The goal of the project is to create a farm-type campus where Honduran men can come and receive pastoral training while supporting their needs through the farm income. During this project, Ed had the opportunity to spiritually mentor a man named Alexi for one month. It was a blessing to come alongside this new believer and encourage him in his new found love for Jesus. Opportunities are plentiful for you to join us in these mission works to share God’s love and His plan for eternity with the children and adults of Honduras! We invite you to join us as we build for eternity through Volunteer Construction Teams. Ministry volunteers are also needed to serve children, women, and men. We also extend an invitation to partner with us through prayer support and financial giving. We would be humbled to have you join us in these important works in Honduras! Contact us at: edvalschubert@yahoo.com Eternity matters too much to not be involved! Want to read about a real-life miracle…or three?!!! Then read on….. I have been so excited to grab a moment to share with you the exciting events of the first-ever Women’s Retreat in Zambrano which Ed and I hosted on Sunday May 2, 2010. I want to tell you about the Retreat in story form…beginning from the moment God placed the vision for the Retreat on our hearts until the closing moments of the event. It is long, and for that I am sorry, but I know no other way to do it justice than to show you the deliberate road God laid out up to that day. Our God is not random, and in His economy, everything has its time and its purpose. The vision for the Retreat was born in our hearts in January of this year. The Lord began to prompt our hearts to consider how to reach out to the women of our neighborhood. Our target group was to be women with whom we had weekly contact, or women who lived near us whom we knew to be in great need either physically or spiritually. The women fell into one or more of the following categories: women living in abject poverty, some without the basics of water or electricity; women living in situations of domestic violence; women with great fear or little hope; women raising families on their own without a spouse; unsaved women; or saved women in need of encouragement to go beyond ritual to relationship. I prayed for weeks for Gina as myself and a small leadership group prepared for the Retreat. I was so excited for Gina to attend the Retreat; I was praying she would become saved and that God would heal her marriage. Four weeks before the Retreat, Gina and her husband were murdered in an apparent robbery. Gina was only 23 years old. I am sure she thought she had all the time in the world to “someday” make a decision for Jesus. Oh, how the Enemy deceives us. Ed and I were absolutely crushed by the murders of Gina and her husband; just so heartbroken for two lives that ended in such violence, saddened they had lived their lives in such violence and distance from God. The entire situation caused us to pray with more fervency for the other invited women. Our family motto took on a whole new urgency, “eternity mattered” to every woman on our invite list in a suddenly more intimate way. some bicycles. Praise God, Martha and her friend were not hit by any of the bullets. Once again, we could see the Enemy so hard at work to keep the women from receiving a spiritual blessing they so desperately needed. 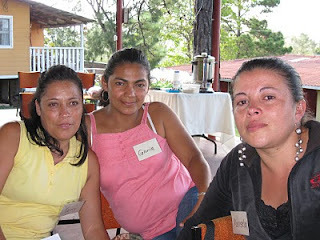 I invited 3 godly Honduran women to do the teaching during the Retreat. With expectant hearts at what God wanted to do in the lives of the invited women, we committed ourselves to pray and fast the final weeks leading up to the retreat. We poured out our hearts interceding for the women who would come to “sit at the feet of Jesus” for the day. I also asked 3 North American missionaries to commit to being a “prayer force” while the event was taking place. During the actual event, these 3 women walked around the property, or sat in the back of the pavilion praying over the participants and the leaders, and inviting the Holy Spirit to show up in all His power. The day of the retreat we also prayed that the women would not feel ashamed to come, even if their clothes were not the newest or the finest. We asked God to not let any embarrassment hold them back. I also enlisted each one of you to join us in covering the retreat with prayer protection and power. The work done in prayer made all the difference dear friends. The battle had already been waged, and won, by the time the first woman gave her life to Jesus! We had chosen early May as our retreat time because it is typically dry, but as the day of the Retreat approached, we received an unexpected surprise…rainy season came early! We had planned the retreat to be outdoors, so heavy, torrential rains would cause a major problem for us. So, petitions for a dry day began to fill our prayer times. The day of the retreat, we awoke to drizzle, but by the time the first woman arrived, the clouds had cleared and the day ended up just beautiful! Yeah God! Some people tell me that having God do a miraculous healing from a terminal illness is the most incredible work God does. I tend to believe that the most miraculous work God does is to change an unbelieving heart into a believing heart…to take a dead person and give him or her life in Christ Jesus. 1 John 5:11 & 12 tells us, “And this is the testimony: God has given us eternal life, and this life is in his Son. He who has the Son has life; he who does not have the Son of God does not have life.” Many of the women who entered the gates of the retreat property were walking dead women. They were unsaved and dead in their sins; separated from Christ Jesus, enemies of God. Praise Jesus that at least 2 left alive and friends of God!!!!! Digna Marisela entered the retreat lost, dead, and living a life of adultery. During the retreat, the Holy Spirit touched her heart and she gave her life over to Jesus Christ. She is asking for prayer so she will have the strength in Christ to leave her adulterous relationship and that God will restore her family. She wept so many tears of repentance over her sin and tears of joy over her new found treasure! It was breath-taking to behold! Yeah God! Yeny has been practicing ritualistic Catholicism, far from God in her heart and painfully empty. Yeny found the true Jesus, exchanging ritual for relationship. She needs prayer for courage to walk out her faith, and protection from the Enemy’s lies in her mind. God wins again! Gloria’s story is a tender one. I did not originally invite Gloria…but God did. She received an invitation because another woman could not attend, so she shared her invitation with Gloria. I first met Gloria during a community meeting in December. Unknown to me at the time, Gloria and her children were hiding from her husband, a violent drug-abuser. Gloria had fled her home with her children and they were sleeping in an abandoned day care building at night. (This is the same day care building I have been using for our Casa de Luz Zambrano campus children’s project since late January.) During the day, they hid behind a large water tank near the day care building, eating and playing in the tall weeds around the tank. Gloria does not know Jesus. She made the comment to one of our leaders that hearing the Word and listening to the praise songs and prayers were incredible for her. She said she could not express in words what the day had meant to her and how thankful she was to have had the opportunity to attend. Praise God that He allowed that invitation to make it to her hands! Yeah God! Gloria has had a taste of God’s goodness, but we so desire for her to feast on His love! Will you join us in praying for Gloria’s salvation, and for her husband to leave his drug lifestyle and for the family to know peace and healing? I overheard one woman say that the retreat was the first time she had ever truly felt happiness and joy. She was awed by the experience. Another woman stated it was the first time she had been invited to sit and let God talk to her. She felt so renewed and refreshed by the day. God is at work. Yeah God! Our leadership group was astounded by the great percentage of women who confided to our leaders that domestic violence was a regular danger in their homes. One of our leaders, who lives in another city, asked me how I keep from feeling overwhelmed by the incredible depth of need in just this small group of women. I told her that honestly, some days it feels overwhelming, like I am drowning in a sea of never-ending need. I can only keep pressing on by remembering I am not called to be a Savior, I am simply called to be obedient and do the very thing my Savior asks me to do in the very moment He asks me to do it. Nothing more. Nothing less. Simply obedience. Jesus is the only One who can rescue or save. As I look over the photos I took that day, I marvel at how lovely the women look. Each one took great care to be clean, dressed in the best they own, not wanting to feel awkward by not looking her best. Big, dangly earrings were the accessory of choice that day! (smile) To look at the photos, one would assume these are women who could sit next to you in any church in the United States and not seem out of place…and they could. What is my point? My point is that while these women appeared to have it all together, to be collected and pleasant, the majority of them were dying on the inside; their wounds being potentially fatal, but concealed. The photos reveal women with creamy brown skin and ebony colored hair, but they don’t reveal the state of the heart. God sees the heart. He saw broken women, lost souls, wounded hearts, frightened spirits, and deceived lives. If I had taken a photo in your church last Sunday, what would the photo reveal? I would guess much of what my photos reveal…lovely dressed people with a pleasant and polite smile, trying to look their best so as not to feel awkward or out of place in a sea of faces. But what would God see? Have we taken the time to look past the appearance and see the state of the heart of the person seated next to us in church? Men, women, teens, and children enter our church doors every Sunday in a state of walking death. I ask myself how many times I have missed the opportunity to share Jesus, or even just a hug, with someone in my own church pew. Someone very dear to me who lives in the United States is going through the valley of the shadow of death right now. She is in need of a touch from our Savior. She entered a church last Sunday seeking peace, encouragement, and maybe a touch of love from Jesus’ people. Sadly, she exited the church without one single person extending the love of Jesus to her. She entered God’s house with a bleeding wound but it was concealed from sight. Had she stumbled in off the street with a physical wound, someone would have called 9-1-1 for an ambulance or applied a bandage to help her stop the bleeding. But her wound was of the heart, spiritual and hidden. She looked good, but she was bleeding to death. Look to the heart today! It could save a life! When God called us to Honduras nearly 9 years ago, one of the issues I raised with Him was about insects. I know that sounds really unspiritual and very trivial, but I was concerned about bugs. You know, those tiny little things which give you the willies when you find them in your bed, your food, or your hair?! Bugs. I reasoned that if bugs were a certain size in Illinois, which is not tropical or rainforest-like, then what size might they be in a place with lots of rain, foliage, and humidity? Well, God assured me that since He is big and powerful enough to save me from my sins, He can surely save me from creepy crawlies! (smile) So, we came and yes, there have been plenty of encounters with bugs over the years. Each May, with the arrival of the first rains of rainy season, the flying termites come. They swarm, in giant masses, literally thousands upon thousands. They enter the cars, houses, stores, everywhere. For some reason, the past two years they have liked AJ’s room a lot! He has spent hours trying to kill them, duct tape them, and eventually sweep up their black wings which they shed upon landing. 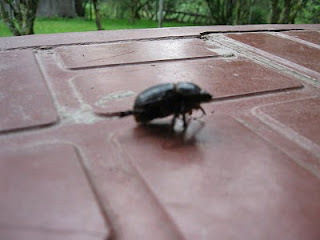 About a month before the termites came, we had a plague of giant black beetles. Now, I am talking giant…they are about the size of a man’s big toe or larger, shiny and black, with a hard shell. They sound kind of crunchy when you walk on them. 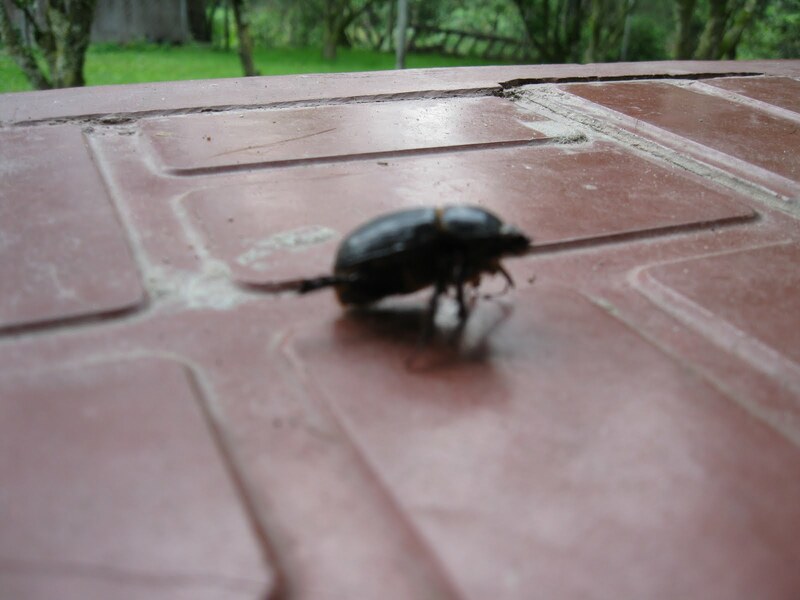 Oddly enough, these “beetles on steroids” have a consistent habit of falling over onto their backs, sticking their spiny, gross legs up in the air, and usually they never can get back up again…weird. We have screening on all of our windows. Double screening in fact; a layer of thick, heavy screen followed by a lighter more fine screening over top. So it is not easy to wiggle underneath those layers of screen to enter the house. A window is situated over our kitchen sink. This window has been the focus of a “God moment” for me the past few days. For reasons beyond my understanding, nine beetles decided to make a suicidal attempt to squish between the two layers of screening. (Remember, not an easy task by any means) They are now dead, obviously, decomposing into crunchy dark spots on my window. I can’t peer through the opening without observing their demise. I wonder where they thought their struggle would lead them. Hummmm…so I got to thinking…I am anything like these critters? As I did dishes this morning I sensed God was giving me an object lesson with these nine dead bugs. Bizarre, but they made me think of all the times in my own life when I have struggled to squeeze into places for which I was neither made nor called. Places of sin, which as a Princess Warrior of the Mighty King I have no business being. Places of title or prestige, and pride which only beckon me to spiritual death. Or places where man has tried to label me as “this” or “that” but from which my Redeemer has already redeemed me. Just like those beetles, I find I have strained so hard to enter (and be trapped) in an area which holds only decay and rot, nothing of life or joy. As much as those bugs reminded me of where I do not wish to return, they also reminded me of the glorious truth of my freedom in Christ! Only in Jesus Christ is there life, joy, peace, forgiveness, restoration, intimacy, and hope. In Christ, I do not have to try to force my way into any place or any position or any relationship. I can simply be. Be obedient to my Father. Be at peace to enjoy my position as a forgiven daughter of the King. Be transparent with people. Be who Christ has made me to be without worrying about being someone else. Well, I know this has been a rather “creepy” note. But, it is amazing the things God will use to teach us a deep truth about Him and His love for us…even black, crunchy beetles!